Endurance racing is hard on drivers. Multiple stints over 6, 8, 12, even 24-hours can take their toll. But what about spectators? Having attended a number of the longer endurance races in the TUSCC over the years I can tell you with first-hand knowledge that the older I get, the longer the races become. There is a way to beat the fatigue as a spectator. However, up until recently, getting access was at best expensive, if not impossible. Prior to 2012, access to Porsche hospitality tents was generally limited to VIPs, Porsche executives and customers of local dealers who were getting wined and dined as part of the Porsche buying process. The private, air-conditioned tents were off limits to all but the anointed few. Then, in the 2012 season, that changed and Porsche opened up the tents to any fan with the desire and money to pay. Fast forward to the 2015 racing season and Porsche is doing it once again. This time you'll find Porsche hospitality at the Rolex 24 at Daytona, the Lone Start Le Mans at the Circuit of the Americas and Petit Lemans at Road Atlanta. For me, it's a combination of things. First and foremost is having a shaded, clean and air-conditioned area to call home base. Each year Porsche sets up a pretty swanky tent filled with tables, chairs, food and beverages (adult beverages included), large flat screen TVs with live race feeds, racing games and simulators. Lastly, at all the hospitality tents I've been in, Porsche tows along this air-conditioned trailer that has clean and cool bathrooms to be used as needed. This is a huge step-up from the dirty smelly porta-potties and other crowded facilities. It should be noted that most of the included items above are available over multiple days. 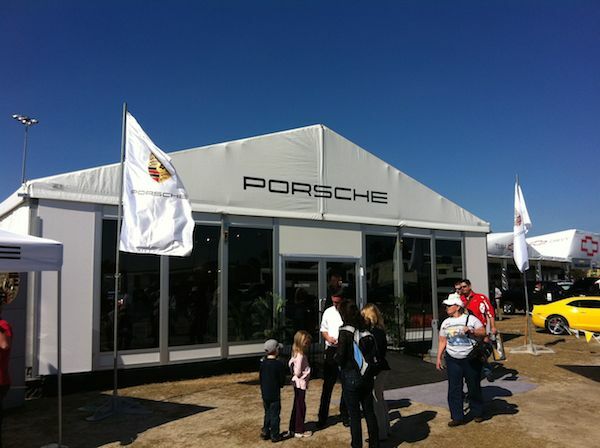 For example, at Daytona this year Porsche Hospitality is open from Friday the 23rd to Sunday the 25th. That means multiple meals, beverages, etc. etc. All these included items add up over the course of a couple of days to pretty much pay for the cost. Everything else is just a bonus. While you might not want or need hospitality for every race, I highly recommend it for a race like Daytona if you plan on spending all 24 hours at the track. Unfortunately, once you partake in Porsche's hospitality it's pretty hard to go back to attending a race without it. If you think it's something you want to try, you'll need to act fast. Space is limited for each event and it usually sells out fairly quickly. Simply visit porscheracingusa.com to reserve your spot. Definitely worth it for old geezers like me – a long way from tent camping at the track back in the day! I was truly impressed with the Porsche hospitality arrangement at COTA last September. It was quite a bit more than $350, but worth it for the comforts and opportunities to actually chat with the factory drivers who are all very gracious people. I always try to sign up for the hospitality tents. You meet many wonderful P car owners to say the least. I met one at a luncheon session a year or so ago and learned his father had a 911 for sale. Since I had an open garage slot, I went to look at it and bought it on the spot. No regrets and was certainly unplanned but worth the price of admission. I too enjoyed the Porsche hospitality tent at Dayona in 2015. Looking forward to the doing so again at COTA in the fall. It was worth every penny.